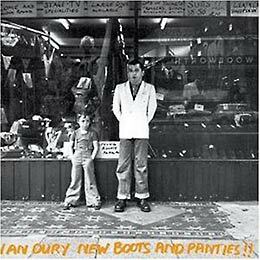 Ian Dury was another artist who 'shirt-tailed' onto the burgeoning punk scene in 1977, although he had been around on the London pub rock circuit for at least three years prior to that, and had released a couple of singles in 1974 & '75 as Kilburn & the Highroads. It was probably his signing to Stiff Records in 1977 that drew him to my attention: that and his occasional use of profanity and innuendo, all very important to a 16 year-old! The songs are (like Trevor) clever (or should that be 'clevor'?). Dury's use of language is intelligent and thoughtful and he draws his inspiration from normal life and from the slightly colourful working people one would find in the East End and Essex, where he grew up. As well as intelligent and thoughtful, Dury's language is, at times, colourful! In the opener, 'Wake up and make love with me' he leaves little to the imagination, until that is we reach the 'climax' when he reminds us that "what happens next is private, and it's also very rude!" Musically it is a diverse collection, and very well played, in contrast to much of the contemporary punk material. But this is not punk: it is rock 'n' roll, funk, disco, even music hall (and Prog? ), and heavily rooted in East London. Even 'Blockheads', the nearest musically to punk, seems to be ridiculing the associated mindset. So why does it appeal to a middle class Yorkshireman? I think it's the variety of the music, the wit of the lyrics, and the quality of the musicianship that have lasted the most, as I listened again. There's the pathos of 'My Old Man'; the playfulness of 'Billericay Dickie' & 'Clevor Trever', and the (im)pure profanity of 'Plaistow Patricia'. This is a collection which rewards coming back to after all these years.